In a bizarre twist, Donald Trump's campaign manager KellyAnne Conway said she will stay with the Trump campaign until the "bitter end, unless..." And then she just left us hanging. Conway was speaking to MSNBC's Chris Matthews when he asked Conway about her extended social media break, which took place after a 2005 tape was of Trump making inappropriate comments about women was leaked. Trump surrogate Rudy Giuliani even took over for one of Conway's scheduled appearances, leading Fox News' Chris Wallace to ask if Conway was "unwilling" to defend Trump's comments. Giuliani denied this, saying it was a scheduling issue. Matthews had to repeat his question multiple times before she answered it. "You guys need to fact check before you start running these screaming headlines," Conway told Matthews. "I was making pancakes for my kids!" She continued to explain that she had "obviously" been in debate preparation. Conway even jokingly slapped Matthews' knee. But she still left us hanging, saying she was here right now "in the debate hall where [Trump] just performed beautifully." 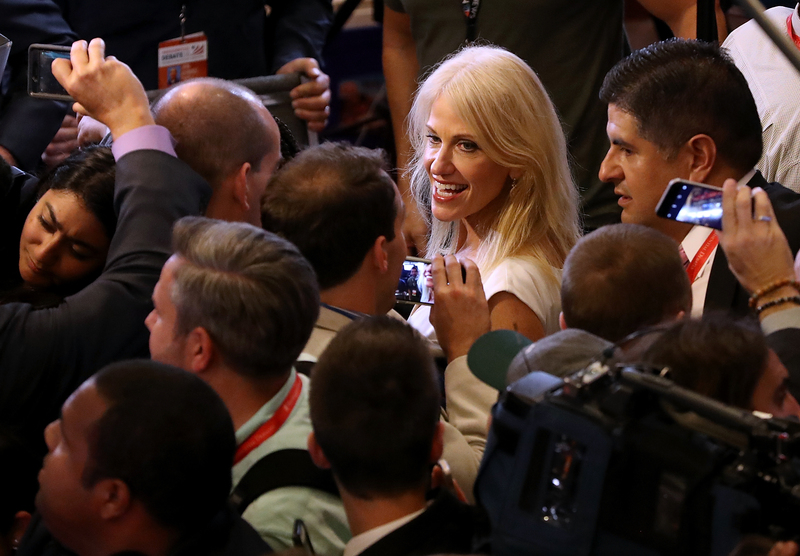 Conway made another appearance later and finished her statement, saying "I'm with him until the bitter end unless someone in my household needs me," according to a tweet from Buzzfeed News Legal Editor Chris Geidner. "He is very gracious, he's a gentleman," Conway told MSNBC about Trump, adding that some Republicans who don't support Trump have sexually harassed young women. She told MSNBC that she remembers members of Congress "rubbing up against girls" and "sticking their tongues down young women's throats." The vague, wandering way Conway answered Matthews' question made it seem like she was hesitant to commit to the Trump campaign, but for now she's robustly Team Trump. Conway tweeted several times during Sunday's debate, calling Trump's opponent Hillary Clinton, "pedantic, lawyerly, technocratic" in a tweet. She also declared Trump the winner. Conway also commented on a recent Saturday Night Live sketch in which cast member Kate McKinnon portrayed Conway being constantly interrupted on her day off with news of Trump's latest controversial statement or action. "We got a good laugh in our crazy house!" Conway tweeted, apparently approving the sketch. The loss of Conway for the Trump campaign could be disastrous, as she is one of Trump's more vocal and visible female supporters. But Conway has said she's sticking with him until the "bitter" end; whether that end is Nov. 8 is yet to be seen.